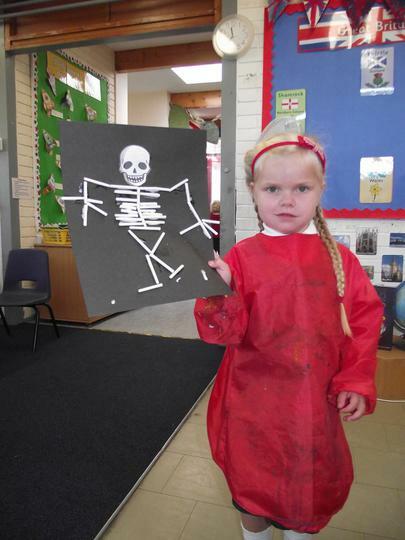 Mars Class is a mixed class of reception and year 1 children. Our teacher is Mrs Hampson and Mrs Willaims is our TA. This year we have 12 Reception children and 14 Year 1 children. We are fortunate to have our own outside learning area which we use everyday, come rain or shine, to enhance our learning. 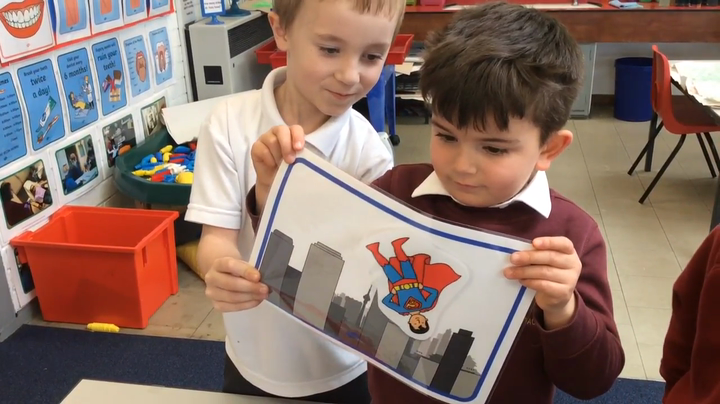 The ethos in our class is to promote happy, independent and confident learners who are willing to try new activities and find success in their everyday learning. We believe every child is unique and we aim to tailor lessons to the individual needs of the children. In Mars we have our own class bear called Edward, who goes home with a child each weekend. He is normally a very well behaved bear and, with the help of the children, records his adventures in his very own diary! The children are always very excited when it is their turn to take Edward home and we all look forward to hearing about their time together. We also have our very own African Snail called Stanley. We love to take turns to look after him making sure he has enough food and water. 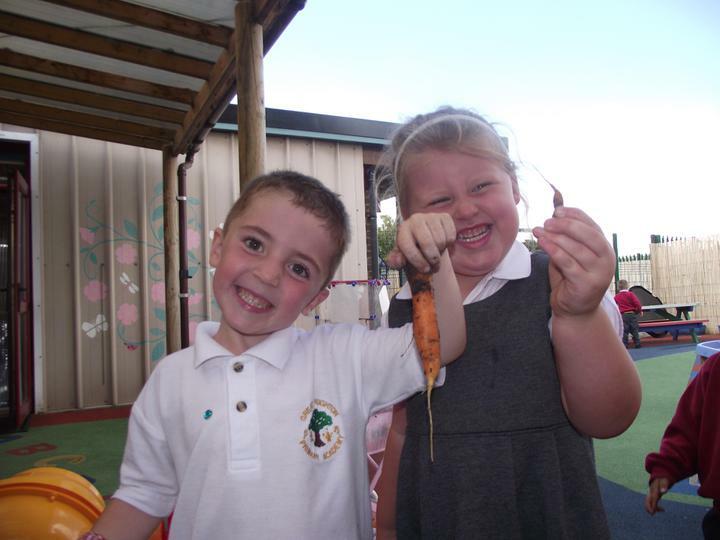 On this page you will find weekly updates of our learning and any exciting things we have been exploring! We hope you look forward to reading all about our learning journey. Edward bear and his very own backpack! Things we get up to in Mars! In science this term we will be learning about animals, including humans. We will learn to classify different animals, learn about their habitats and what they need to survive. We will also be learning about the human body, how we change from babies into adults and what humans need to keep healthy. We will be exploring the life of Samuel Pepys and the impact of his diaries. We will be using his diaries to learn about the Great Fire of London. We will compare things from the past to today such as fire engines, houses and making bread. As part of our topic we will also be learning about the monarchy, British kings and queens and today’s royal family. In geography this term we will be developing our map reading skills. We will also be exploring key towns and cities in the UK and what key facilities towns and cities need. We will also be learning about key land marks in London and how it has changed since the Great Fire of London. In maths we follow the National Curriculum for Year 1 and Development Matters for Reception. This term we will be learning about measuring length, height, weight and volume. We will also be recapping the 4 operations: multiplication, division, addition and subtraction. Reception will continue to develop key number skills, learn to add and subtract and be able to measure within the continuous provision. 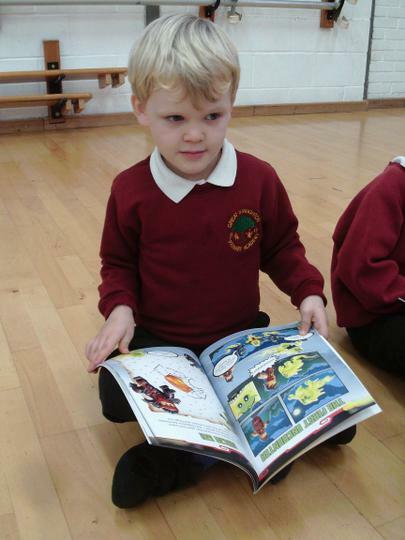 In English we follow the National Curriculum for Year 1 and Development Matters for Reception. We will be exploring a wide range of texts including Samuel Pepys and diary writing, newspapers and chronological reports. We will develop key grammar and punctuation skills. Reception will be working on building simple sentences, using finger spaces and developing and applying their phonics knowledge to reading and writing. In music this term we will be using our voices to sing songs, chants and rhymes. We will be learning some new songs and nursery rhymes as well as learning to play instruments together as a group. We will continue to learn about having a Growth Mindset and what we can do to keep a Growth Mindset. We will also be thinking about how we can support our community. In art this term we will focus on developing key skills using colour, brush and pencil strokes. We will explore the work of Monet and recreate our own interpretations of his work. In computing this term we will be practising and learning about e-safety. The children will be developing their coding skills using simple programs, Beebots, ipads and cameras. They will learn to store and retrieve data. We will be exploring Judaism and Islam this term as well as exploring Christian celebrations such as Easter. In DT this term we will learn how to make bread and will developing our cooking skills. We will also be designing, building and evaluating our own Tudor houses. We will be learning about joining methods and how to make our models stronger. PE: Fundamental Movement: balance, agility and coordination. 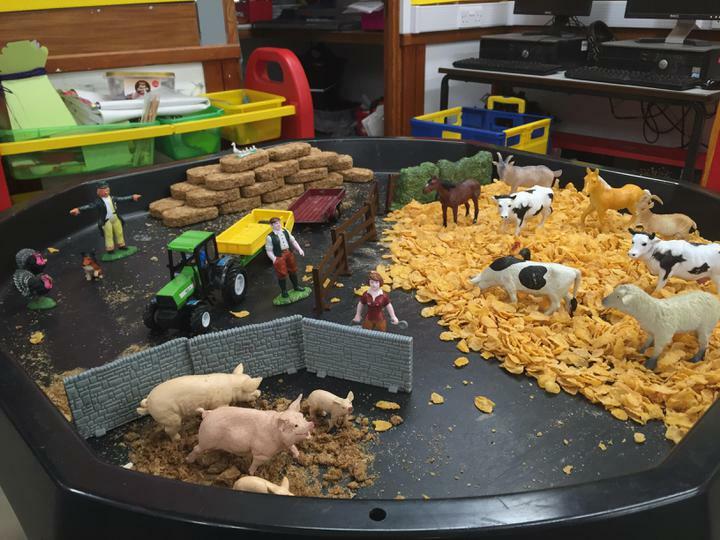 In Science we have been learning all about animals, particularly how we can group them according to their features and according to what they eat. To finish our unit on this we have been learning all about the importance of looking after pets properly. On Wednesday afternoon (27th March 2019) we had a very special visitor in Mars Class - Clark! Mr Nelson very kindly talked to the children about all the different ways he takes care of Clark such as taking him on walks, providing him with somewhere safe and comfortable to sleep, taking Clark to the vet and even how he brushes Clark's teeth! He also showed the children some of the different things he uses to help Clark stay happy and healthy including his shampoo, hairbrush and toys! The children all behaved beautifully and asked some really fantastic questions to find out more information. They then made a poster all about Clark and how to take care of him. Big thank you to Mr Nelson and, of course, Clark! We had a very special mystery reader today! The children all sat super quietly so we didn't wake the baby. Well done everyone! After completing a design sheet the children finally made their 3D Tudor houses from the Great Fire of London. They worked exceptionally hard and explored different ways of joining materials together. I think you'll agree that they are all fabulous! We also finished our unit about the 5 senses with a BIG taste, smell and touch experiment. To explore our sense of taste the children dipped bread into numbered pots and had to record in their books what they thought was in each pot. The blindfolds meant we could only focus on our sense of taste - and the taste wasn't always nice! Next, blindfolded, we smelt the contents of different numbered pots and had to record what we thought the contents were. Finally we explored a number of different objects and had to describe the properties by using our sense of touch. We ended the week with Nate's Grandma coming to be our mystery reader - thank you!! Phew! What a jam packed week! In Science this week we have continued to learn about our senses with a focus on our sense of hearing. The children learnt that sound travels via vibrations and made string telephones to explore this further. They also learnt that some people need help to hear and that sound can help to warn us of danger. After a discussion about how birds survive in winter (after seeing lots of birds pecking the icy ground) we made pine cone bird feeders this week. The children followed the instructions and combined lard and birdseed before squishing it all together and pushing it into the pinecone. 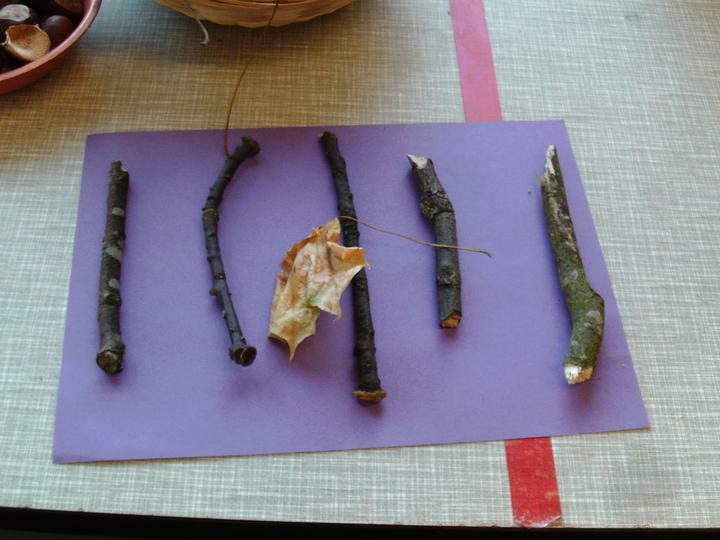 They then took them outside during forest school and hung them around the outside area. On Tuesday we learnt about how we can stay safe on the internet and the children completed some quizzes on espresso (check them out using the log ins that were sent home!) and made posters explaining how to stay safe online. 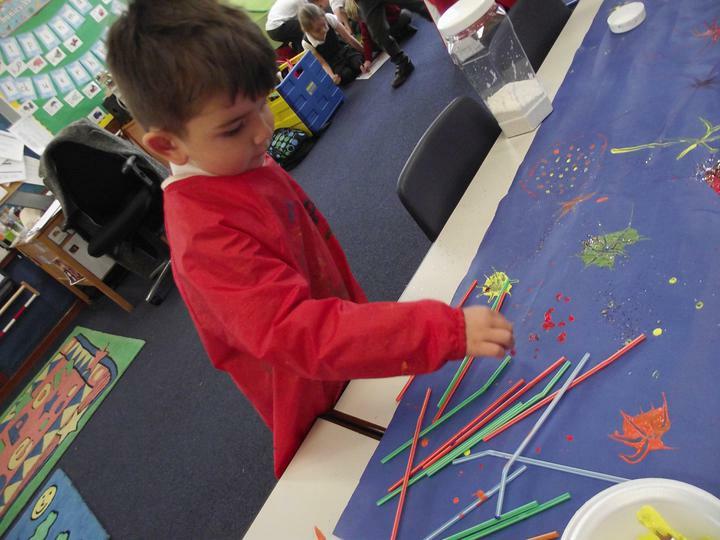 We also had a fab time exploring Chinese New Year and will be using the children artwork to create a wonderful display! I have been SO impressed with how well the children have behaved this week. They have all learnt so much and been SO sensible with all the practical activities. Well done Mars! In RE we have been learning about Judaism. Today the Year 1 children had a go at making their own Torah (Jewish Holy Book) complete with some Hebrew writing! What a jam packed week we have had in Mars Class! We started the week with some very exciting art with Mrs Simmerling. The children used paints and cardboard to create a fiery background on paper. Next week they will be adding silhouettes of London over the top to finish off. In topic this week we have been looking at old and new things and have been suggesting what we think some of the old things might have been used for. We also worked as a class to make a timeline of events from when the Great Fire started to when it was finally put out. Year 1 have enjoyed using the new laptops that were very kindly given to us by the PTA! They have been researching the Great Fire of London independently and recording key facts! Thank you PTA!! In Science we have continued learning about our body with a focus on the human eye. We learnt that our pupils expand and contract depending on how much light there is. We put this into practice by working in pairs to cover our eyes and then look into a (not too bright) light to watch the pupils change. After that year 1 drew diagrams of their eye using mirrors to make sure they were as accurate as possible, and labelled them. Some of the reception children really impressed me this week by challenging themselves to draw and label their eye using the vocabulary provided on word mats! In English we have been learning how to write instructions using imperative verbs. We worked in pairs giving our partner instructions in the classroom that included imperative verbs before writing our own instructions on how to wash your hands and the steps for baking the sweet focaccia bread we made last week! Reception have been working hard on their writing this week and have started to think about the features of a sentence and how we can sound out words to write them. They have been working exceptionally hard! In maths this week we have continued to learn about weight and used scales to measure different items in the classroom to 200g, 400g, 600g or 800g. We had a real focus on being accurate as this is very important when we measure ingredients for cakes! We also practised our reasoning and problem solving skills. Edward bear is having his very first outing this weekend! He will be going home twice a week with different children. (Monday - Thursday and Thursday - Monday). He has his very own backpack that contains a diary to record his adventures and a pencil case full of stationary to help! We are looking forward to hearing what he has been upon to! This week we were lucky enough to have a music workshop! First the children explored rhythm and rhyme by using their voices. After that they used the instruments to the beat they had learnt following instructions when to start and stop. 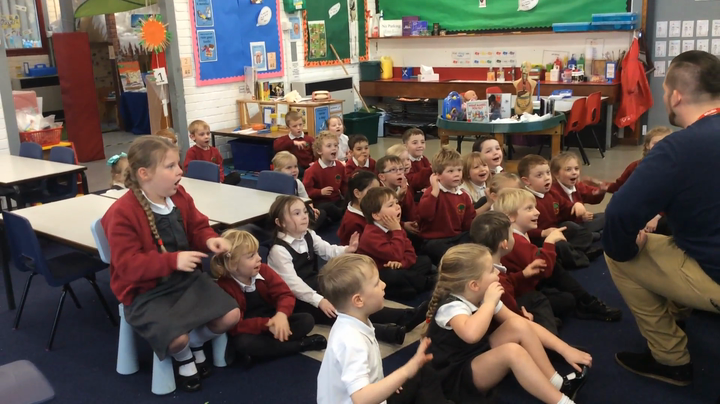 They particularly enjoyed having a go at participating in a 'rumble' where they followed directions when to play their instruments loudly or quietly. We will be using what we have learnt in our own music lessons in school! Mars Class have had a super busy week! In Maths we have been using balance scales to measure the weight of different objects within the classroom. 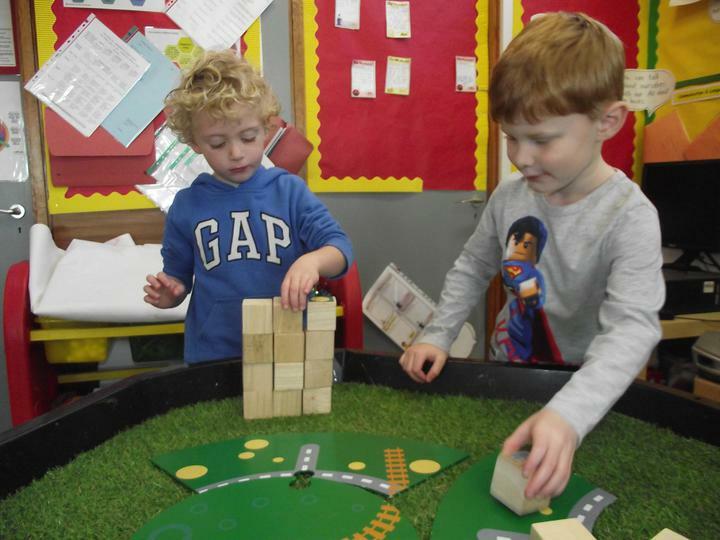 Initially the children used them to explore whether items were light or heavy, before moving on to measure the mass of the objects using cubes. In English year 1 have been writing diary entries as if they had been in the Great Fire of London. They all amazed me with how many key facts they included! 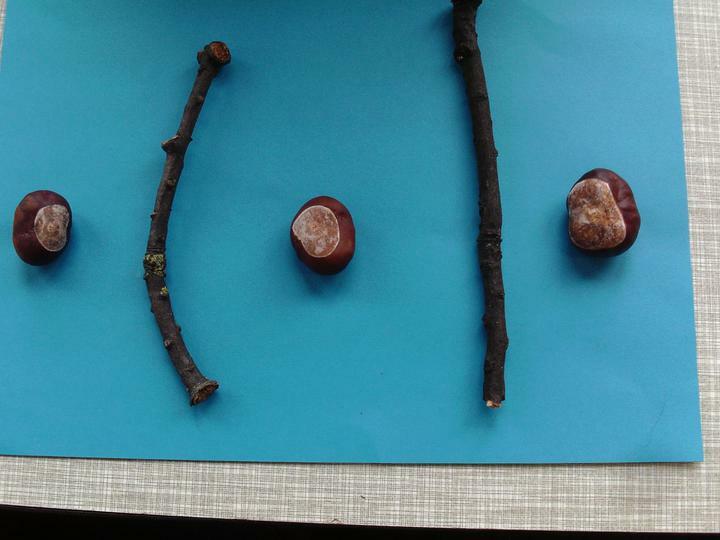 Take a look what we got up to in forest school by clicking on our outdoor learning section by using the buttons at the top of this page! Our topic in Mars this term is 'Fire! Fire!' and is based around The Great Fire of London. The children have all been super engaged and have all contributed in helping turn our home corner into the Pudding Lane Bakery! The children colour mixed to make orange to create the flames and Mrs Williams strategically placed them around the house to make it look like it was on fire! 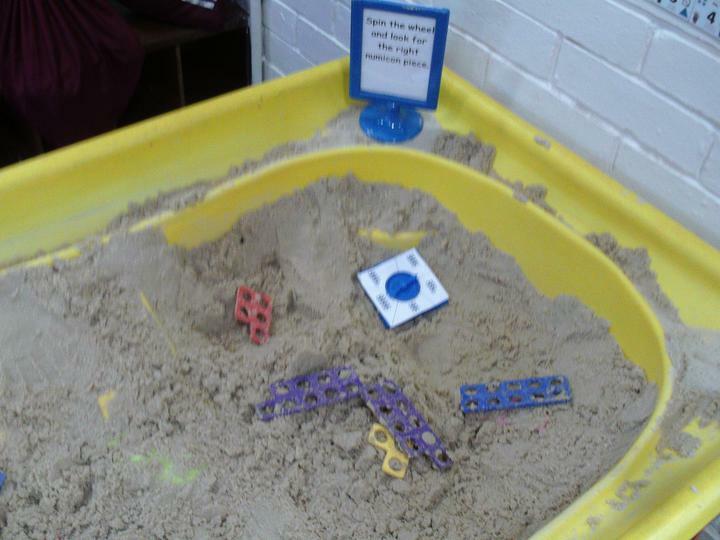 We have also begun to create our 'mini London' and so far have made the River Thames alongside some mini Tudor houses! We are all looking forward to learning more about the Great Fire, so please ask us about any facts we have learnt! In Science Mars Class are exploring the unit 'Animals including Humans'. Last week we crawled through the 'time tunnel' which contained our baby photographs at one end and our current photographs at the other end. We had lots of fun trying to figure out who was who by looking closely at the photographs and discussing what features might give us clues. We also talked about the things we can do now that we couldn't do as a baby. The children used lots of fantastic vocabulary and really impressed Mrs Williams and I with how sensible they were! Well done Mars Class! Mrs Tunnard was our mystery reader on Friday. The children loved waiting to see who was coming to read them a story and listened beautifully to 'Room on the Broom' and 'The Monkey Donkey'. 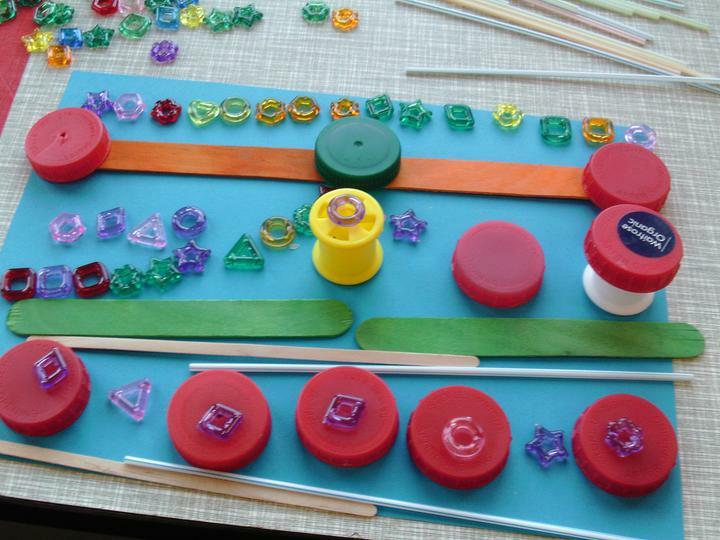 In Science this term we will be exploring the use of everyday materials. 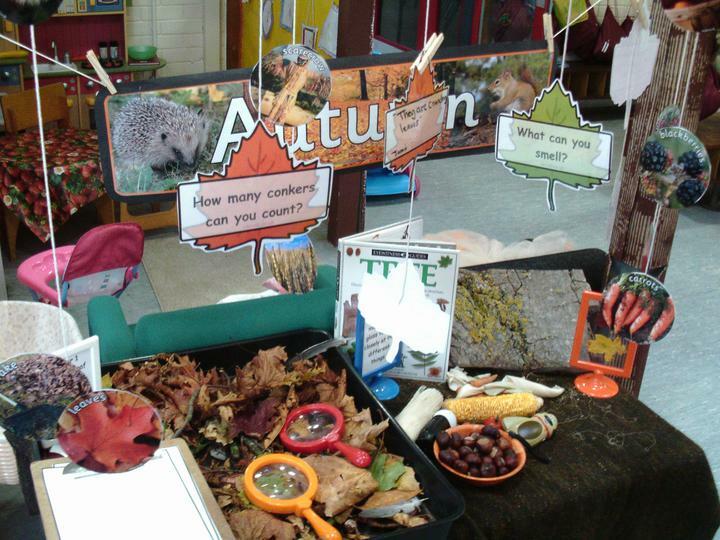 The children will learn to identify and compare a range of different materials as well as suggesting uses for them based on their properties. We will be working scientifically to investigate, explore and explain. Over the term we will be learning about a range of explorers including Neil Armstrong, Bear Grills and Mary Anning. We will consider the impact they had on our lives today and compare what it was like to be an explorer then and now. In geography this term we will be developing our knowledge of the continents, oceans, UK countries and capital cities. We will learn to compare the similarities and differences in physical geography of two places as well as learning to use maps, atlases, globes, compass directions and aerial photographs to complete a study of the local area. In maths we will be following the National Curriculum for Year 1 and Development Matters for Reception. We will be ensuring the children have a secure understanding of place value and number before moving on to addition, subtraction, money and shape. We learn through lots of practical activities and games and will be working on ensuring we can apply our skills in different contexts. In English we follow the National Curriculum for Year 1 and Development Matters for Reception. 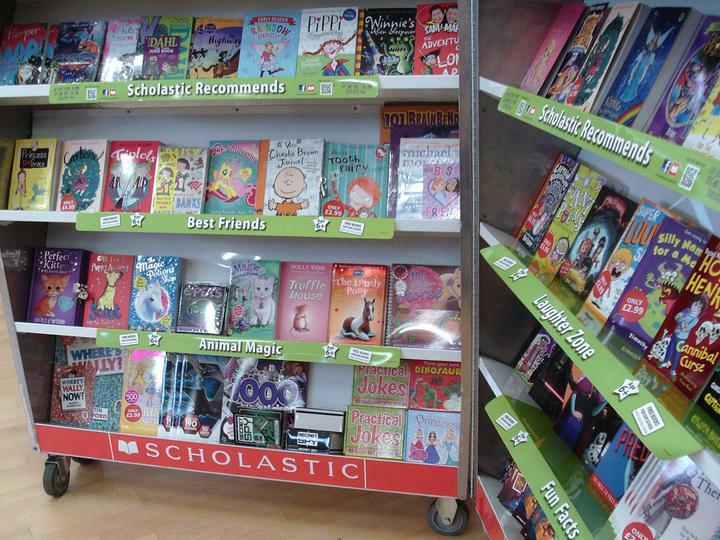 English this term will focus on exploring a variety of text types including non-fiction texts and poetry. We will explore some stories and non-fiction texts relating to our topic, these will include Man on the Moon, Beegu and Whatever Next. Reception will be learning about letter formation, phonics sounds and pencil control. They will develop fundamental skills in preparation for reading and writing. In music this term we will be using our voices to sing songs, chants and rhymes. 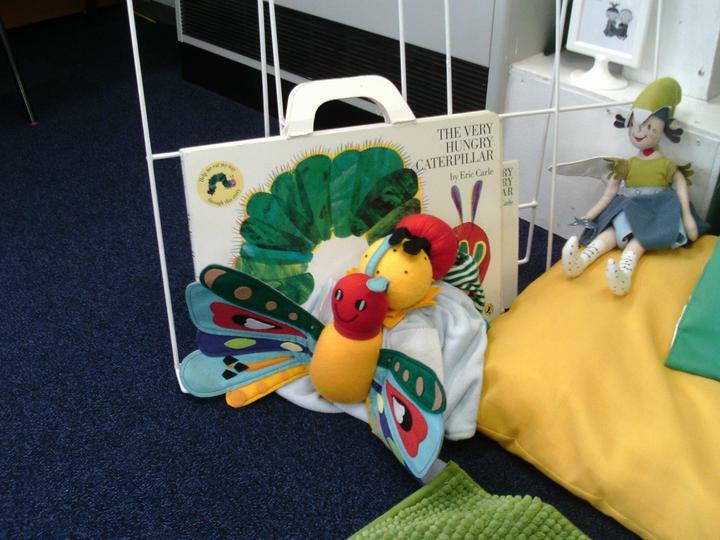 We will be learning some new songs and nursery rhymes as well as experimenting with creating sounds with instruments. Circle time this term will focus on transitions, change, rules and routines. 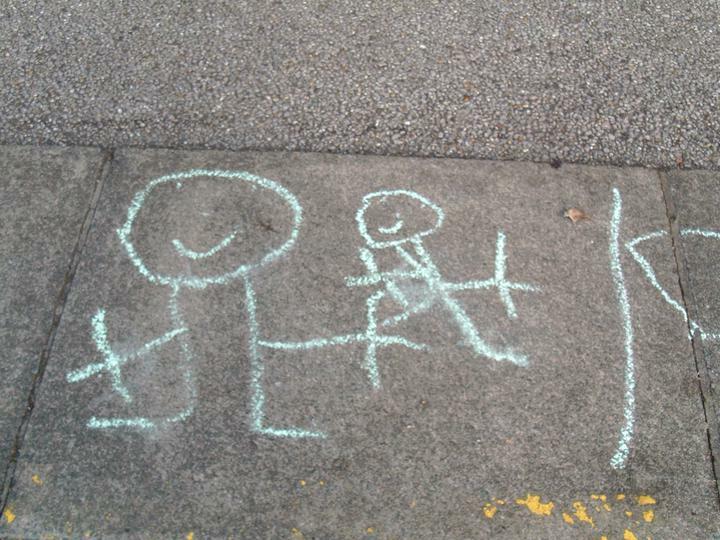 We will also be exploring what makes a good friend. We will also be learning about having a Growth Mindset! In art this term we will focus on developing key skills using colour, brush and pencil strokes. 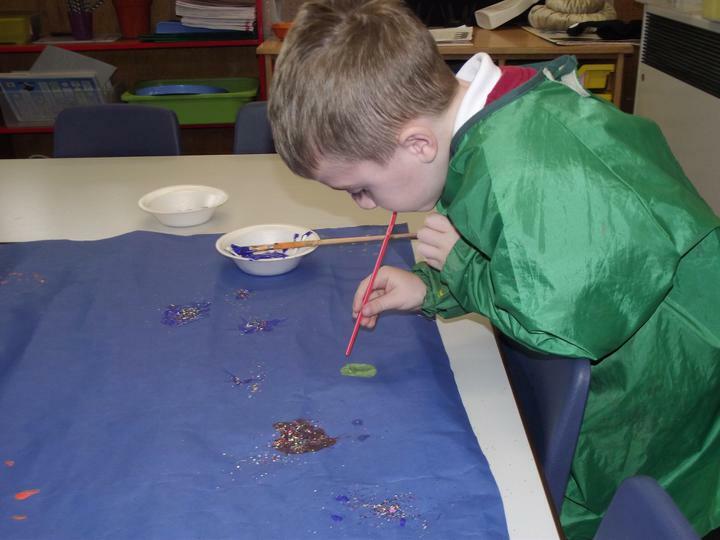 We will explore the work of Van Gough and build up to creating our own version of his Starry Night painting. In computing this term we will be practising and learning about e-safety. The children will sign our E-safety policy and will then begin to develop their coding skills using simple programs, Beebots, ipads and cameras. In RE we will be exploring a range of religious and special festivals and celebrations including Christmas, Diwali, Hanukkah, Advent and Harvest Festival. We will be learning to making some healthy food in DT this term as designing and building rockets and dens. We will learn to manipulate and join a range of materials and will evaluate our designs, considering how to make them stronger. Mars Class has a wonderful morning remembering all those who died in the war by creating some beautiful artwork. Each child in Mars (as well as Mrs Williams and I) added their own poppy on our collaborative piece to remember the brave soldiers. Both Reception and Year 1 had a choice of art activities which will be put on a class display next week (I will post photographs once it's complete). We also read a lovely story called 'Where the Poppies now grow' and the children had the opportunity to share their thoughts and ideas resulting in some fantastic discussions. I am extremely proud of all of the children for working so hard and for all of their positive and thoughtful contributions our class discussion. Well done Mars Class! Mars had such a treat this morning! Piglets very kindly invited us to meet Pudsey bear! 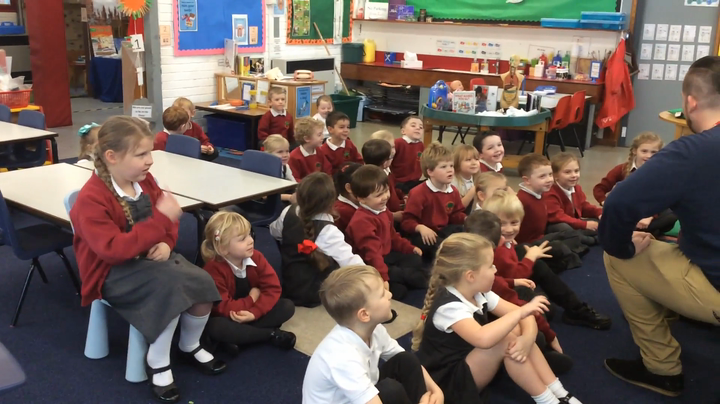 We had a wonderful time and even sang a special Pudsey Bear song to the tune of 'Baby Shark'. The children behaved beautifully making Mrs Williams and I super proud. Mars Class celebrated Diwali by making their own clay Diva Lamps. 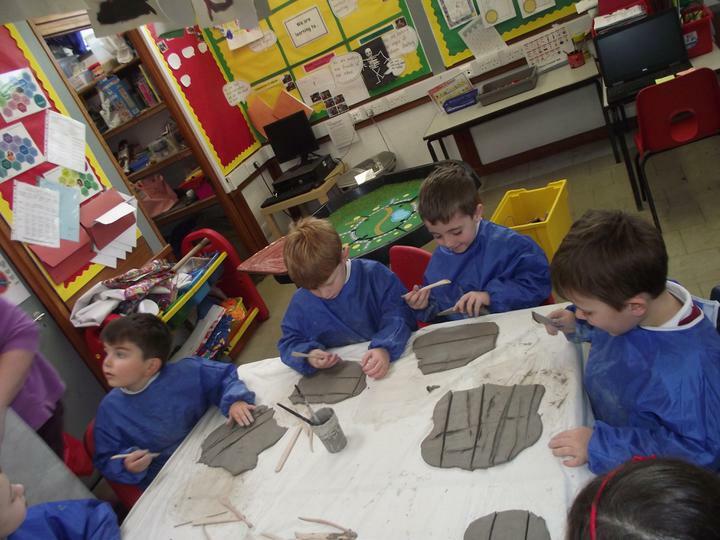 They shaped the clay using their hands and added some fantastic detail using the tools. We are looking forward to firing them in the next week or so. All of the children worked so hard - well done! Mars have had a spectacular week exploring all things Space! We have read the story ‘Man on the Moon (a day in the life of Bob’ and discovered what it might be like on the moon. We listened to some interesting ‘Space music’ and took part in some role play pretending to be having a guided tour on the Moon by Bob. The children all behaved fantastically and shared lots of facts with each other during this time. As a result Year 1 wrote somewonderful postcards recounting their experience on the Moon whilst Reception created some lovely space pictures. In maths Year 1 have been learning about place value, and although it was a little bit tricky finding the tens and ones in a given number, they all worked extremely hard! 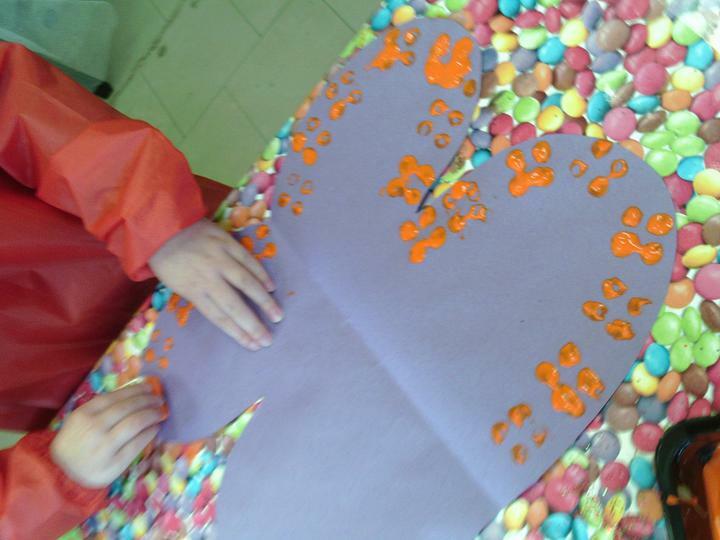 Reception have been practising recognising numbers and finding shapes hidden in shaving foam. We are looking forward to another busy week! This year we have welcomed 12 brand new Reception children to our class and this week they have been transitioning to school. Our Year 1 children have been fantastic in supporting and encouraging them whilst being super role models. We are very proud! This week we have been getting back into routine and exploring the new layout of the classroom. 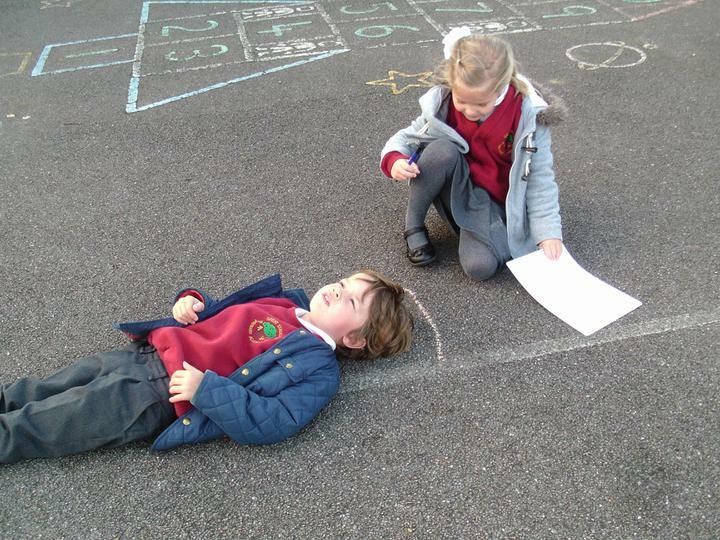 We have introduce Year 1 to their challenges and they have really taken it in their stride! 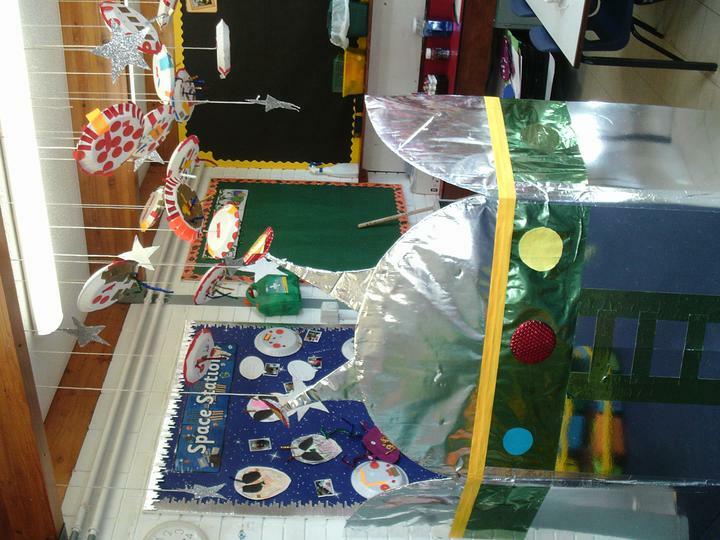 Alongside this we have been exploring our brand new topic - Space! This children have really enjoyed finding out fun facts as well as working collaboratively to create large scale planets for our display! ​​​​​​​We are looking forward to having a super year! Mars class have had a busy but fantastic first week back! We are lucky enough to have Miss David from Hunts SSP for PE and this week we learnt all about how we breathe differently during exercise. In English year 1 have been creating their own acrostic poems and reception have been busy writing about their Easter holidays. In Maths we have all been exploring capacity using different containers. 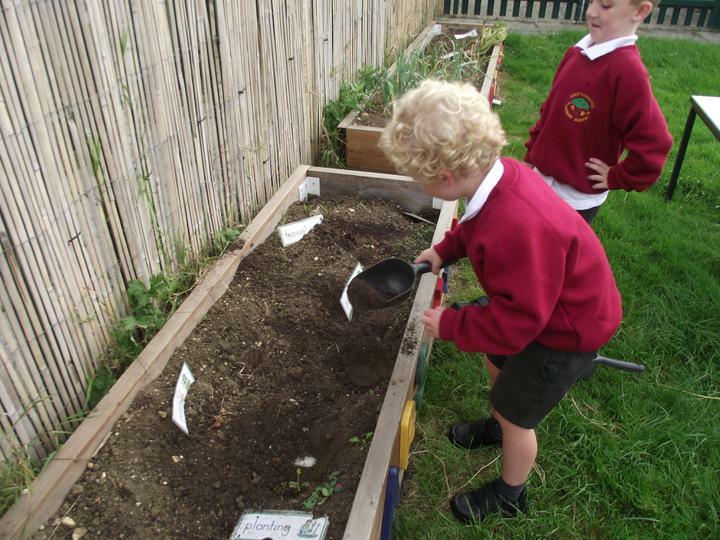 We even managed to do some weeding in preparation for planting our sunflowers! This week we have continued our English work on 'Charlie and the Chocolate Factory' By Roald Dahl. We have been coming up with reasons for and against the chocolate factory closing as well as writing our very own Golden Tickets! In maths we have been learning how to measure using standard and non-standard units of measure, always making sure we check that we are accurate! Reception have been busy completing their independent maths and english challenges as well as their guided activities. All in all a very busy week! Mrs Norman's son Rikki and his wife Shirley came to visit Mars Class. They live in Hong Kong and told the children all about the things that were the same and different about Hong Kong and England. They also taught the children how to say 'hello' (nee-how) and 'hello how are you' (nee-how mah) in Chinese. 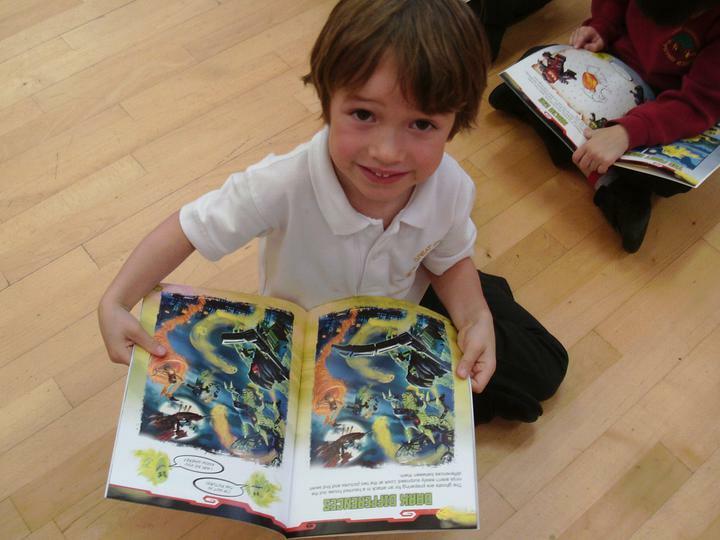 The children were all very enthusiastic and enjoyed learning a new language. It has been a busy few weeks in Mars Class! I am so impressed at how well reception have settled into school, it has been a whole half term already! We have been learning all about addition and how when we add the numbers get bigger. Year 1 have been partitioning and addition numbers in very practical ways, whilst reception have been learning to recognise their numbers and match them with the correct quantities. In English we have been completing some basic punctuation work, remembering that we need capital letters for name she of people, places, the personal pronoun 'I' as well as at the start of sentences. Reception have been busy learning to write their name and have loved laying teachers using as many clipboards and pencils as they can find! To end our week we spent circle time thinking about how our words and actions can affect others. We looked closely at two apples, both were almost exactly the same. The first apple we passed around telling it lovely things. We told it it was clever, beautiful, kind, a hard worker, a good listener and so on. We treated it gently and kindly. The second apple we passed around telling it horrible things. We called it names, told it is was not our friend, that nobody liked it, it was ugly and so on. We were not gentle with the second apple, we dropped it, hurt it, and poked it. There were no gentle hands. Afterwards we looked at the two apples. Even after we had said all those things to them, they still looked the same as before. We talked about how it feels when people say kind and unkind things to us, what it does to our mood and how it makes our bodies feel. We cut both apples in half, the apple we were kind to looked fresh and ready to be eaten, but the apple we were unkind to had gone all bruised and was beginning to rot. I explained to the children that we are like the apples. When someone says nice things to us we feel lovely inside, like the first apple, but when someone is unkind with their words or their actions, we feel like the second apple, bruised and hurt. Even though people sometimes look okay on the outside, on the inside they might not be feeling very nice. The children all participated very well and it led to some very interesting and reflective conversations around being kind and how our actions impact others. Well done Mars Class! Mars Class have worked super hard this week. 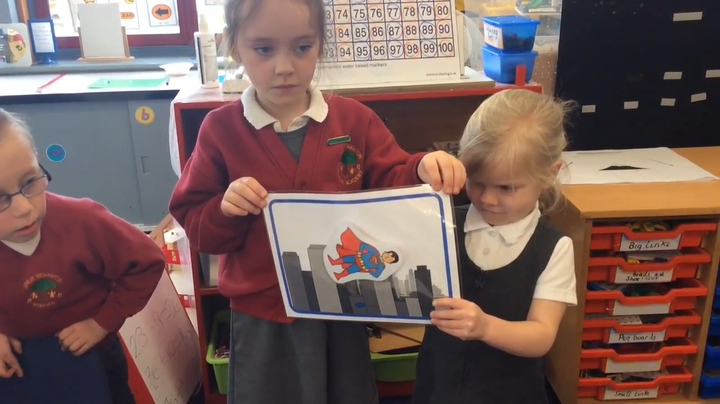 This week we introduced our independent topic work for year 1. Each child has a checklist of topic activities to complete, but they get to choose when they complete each task, the only rule is that they must complete all activities over the (usual) two week period. One activity is adult led, the rest of them are explained and modelled, then the children have free choice. Some of the activities so far have included completing a colour wheel, labelling the countries in the U.K using an atlas, programming bee bots, ordering transport (oldest to newest) on a timeline, building a model to transport a lego man and access to our maths and phonics centre. 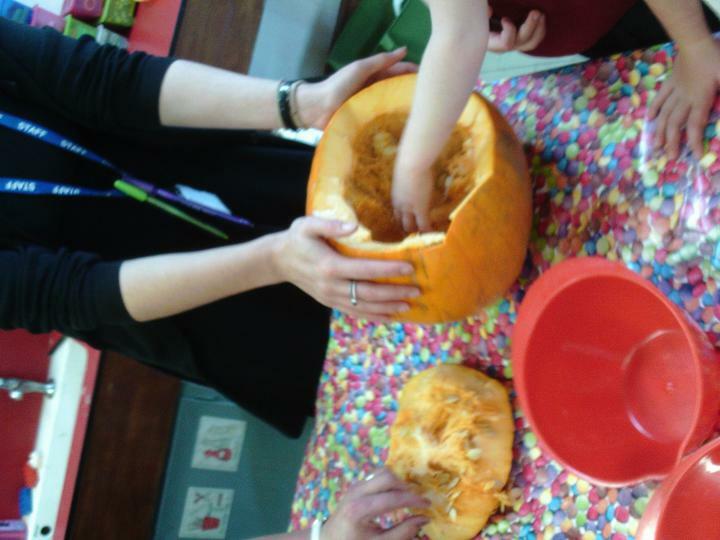 Reception children also get the opportunity to join these activities if they wish to. In Maths we have continued our number and place value work and English we have been writing simple sentences and learning the Gruffalo through drama. We have had a very busy week down in Mars Class! This week we have been reading the Gruffalo and have been exploring the setting of the story as well as the characters, most importantly the Gruffalo himself! The year 1 children worked exceptionally hard to create their very own Gruffalo as well as using adjectives to describe him. 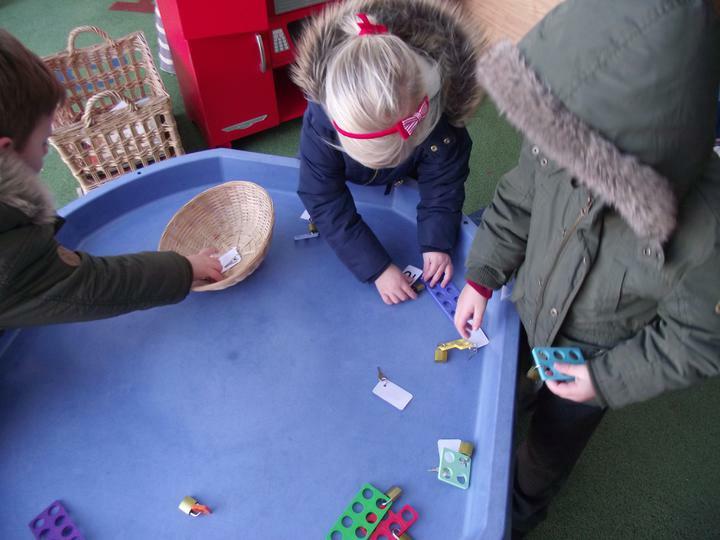 Reception have enjoyed using the small world set up to retell the story using the Gruffalo toys. 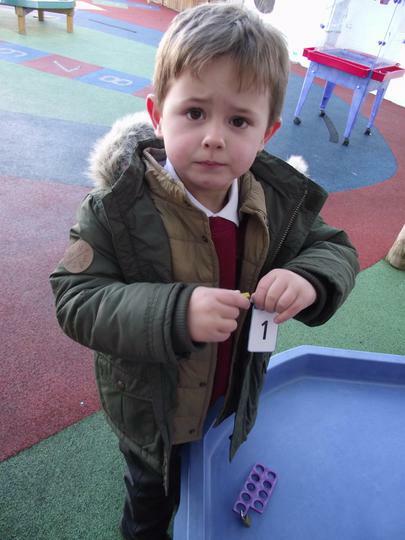 This week we have also been continuing with number and place value as well as practising our number formation. Wow, what a fantastic first week back we have had! It has been lovely getting to know the new members of our class as well as seeing how much the year 1 children have grown over the summer! 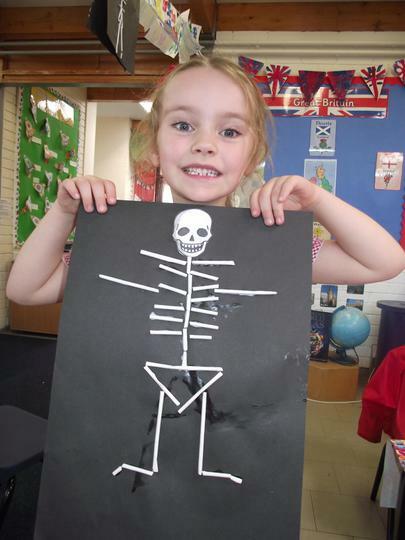 This week we have been settling into school, learning where things are in the classroom as well as getting stuck in to some lovely art and crafts activities. 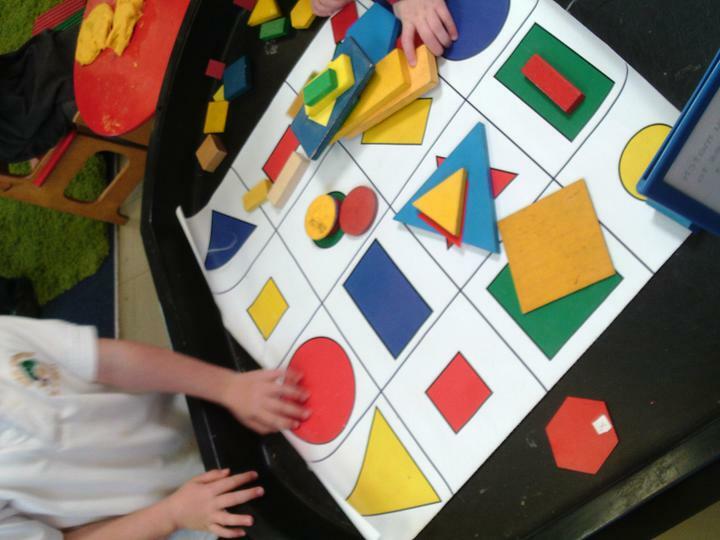 The year 1 children have also been learning how to play some simple maths games. We are looking forward to next week where our reception children will be full time. Some of our exciting science experiments! What a busy week we have had! Today we dug up our leeks, enjoyed a chilly PE lesson reading maps, and finished off our science experiments! In maths this week we have been learning how to divide numbers and objects between different amounts and in English we have been retelling the story of Jack and the Beanstalk. We are looking forward to another busy week. Have a lovely weekend! Our visit from the Postman! ​We were lucky enough to have a visit from the Postman this week! He told us lots of interesting facts about being a postman and answered lots of our questions. He even told us all about how the Queen sends and receives mail! At the end of his visit he let us try on his jackets and hold his postbag! Wow! What a jam packed week we have had in Mars. 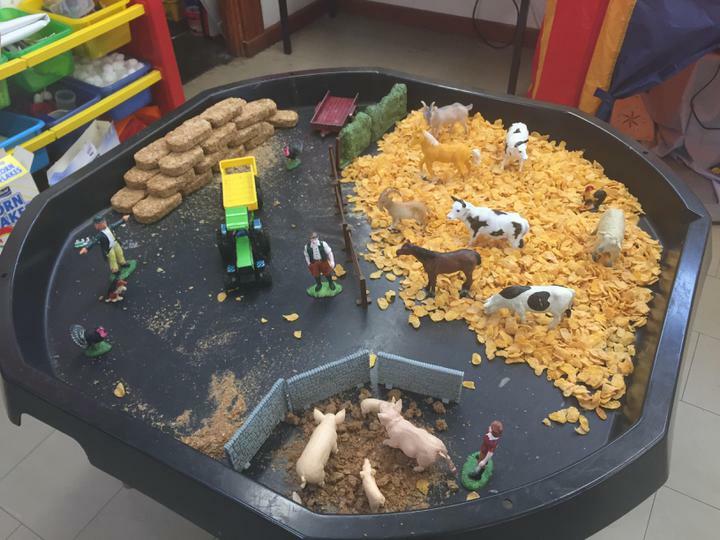 This week we finished our unit on the Little Red Hen and Year 1 wrote the story. 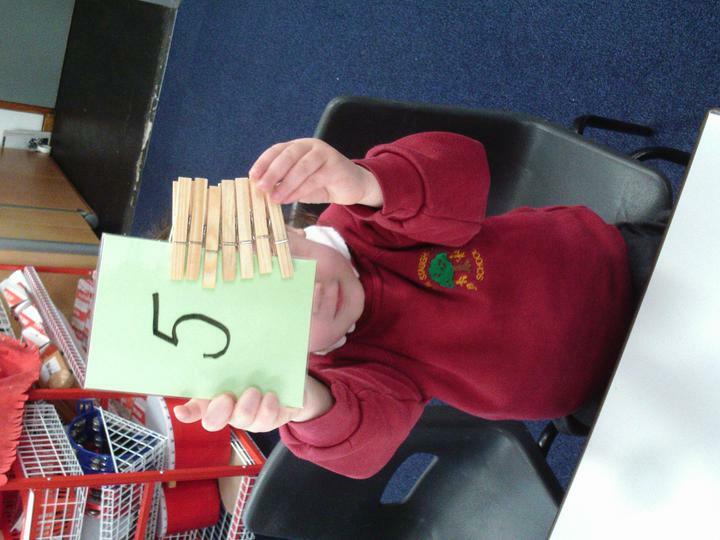 In maths we have been working on our number bonds to 20 (year 1) and number recognition (reception). This week the rest of the class had the chance to work with the pottery lady and make their castles. We also opened our letter from the postman...it was a letter from Santa! The children were very excited to learn that the reindeers are busy exercising in preparation for Christmas Eve, and were surprised that Santa knew they had been practising their Christmas Play! Wow! What a very busy week Mars class have had! This week we have been practising reading and writing our word wall words, we are getting really good! 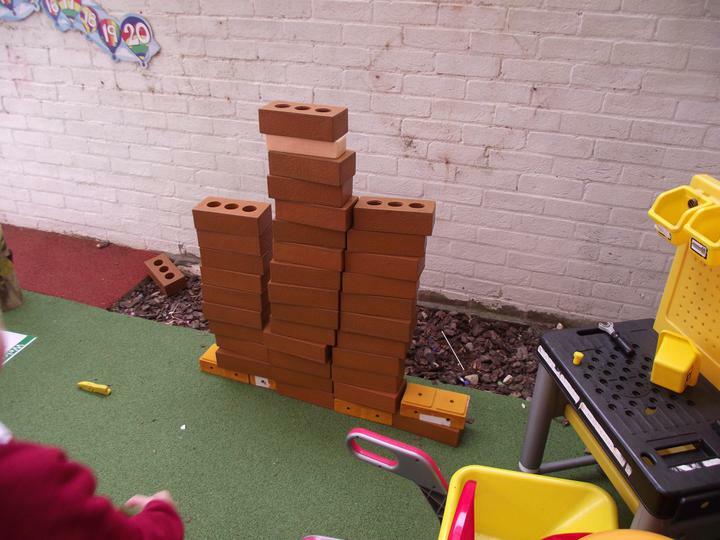 This week some of us were lucky enough to have a pottery lesson and we built our very own castles. It was very tricky, but we kept going! Next week the rest of us will get our turn. On Friday we had our first ever mystery reader. When it was time, we closed our eyes really tight whilst they crept in. We then counted down from 10 and when we got to 0 we opened our eyes to see who it was. She read us a very exciting story called Jack and the Flumflum Tree by Julia Donaldson. It was very funny! On Friday we also celebrated Children in Need by painting Pudsey Bear and having our picture taken with him! Another busy week in Mars! 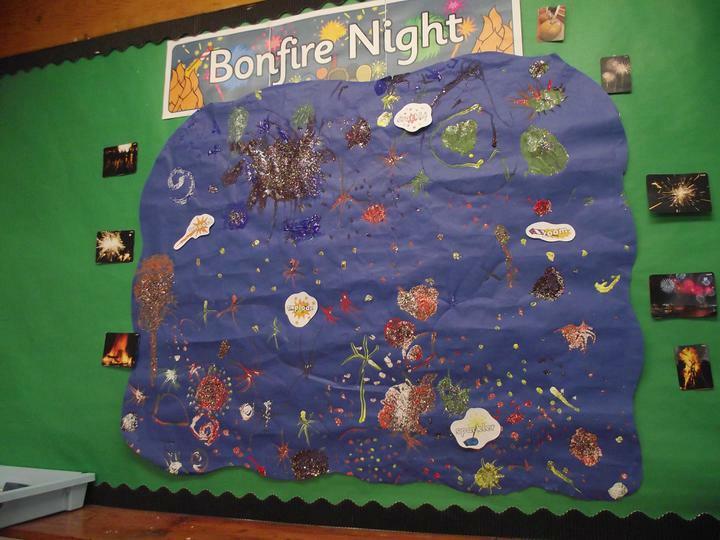 Although bonfire night was last weekend, this week we have been learning about why it is celebrated, bonfire night safety, as well as creating a whole class firework picture. 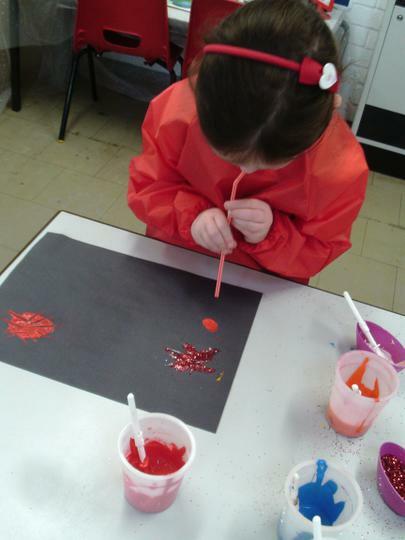 The children experimented with different ways of painting as well as seeing how much glitter they could add! Our biggest hit this week was our numicon padlocks. Numicon are different plastic pieces that represent a number, the children had to match the right numbered key to the numicon piece to unlock the padlock. Lots of number recognition and fine motor skills! In English we have been continuing to learn our Little Red Hen story, hot seating characters, and year 1 have produced some fantastic writing for our class book. 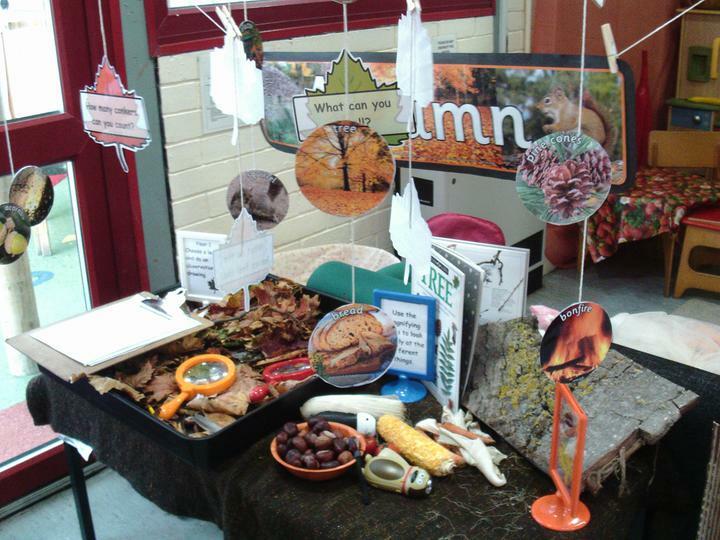 In science we have been learning all about Autumn, what the signs are, what the weather is like and which months of the year belong in this season. 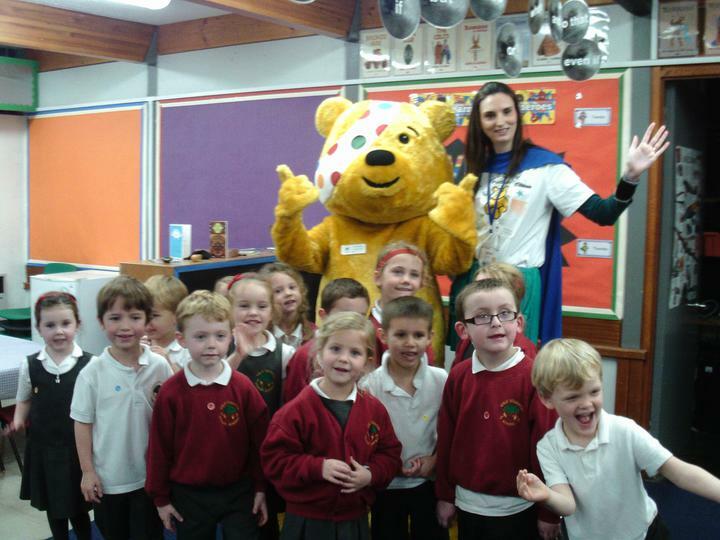 We also had a very special visit from Pudsey Bear this week! 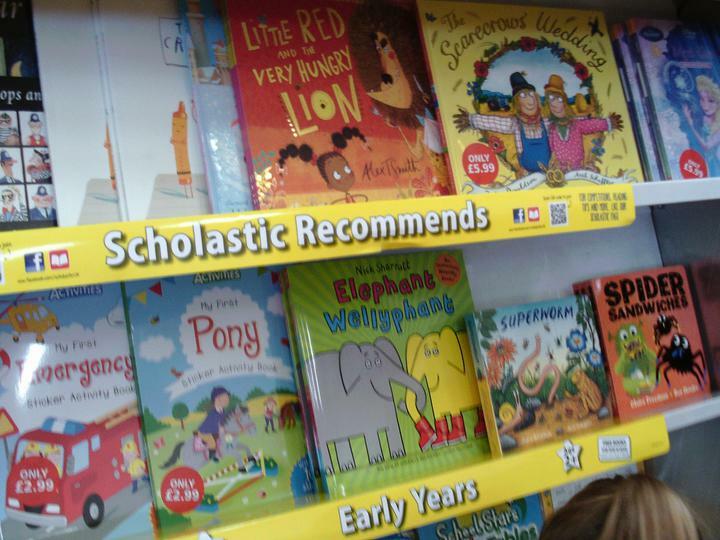 The children were very excited! What a busy first week back! It has been lovely to catch up with all the children and find out what everyone has been doing during the summer holidays. 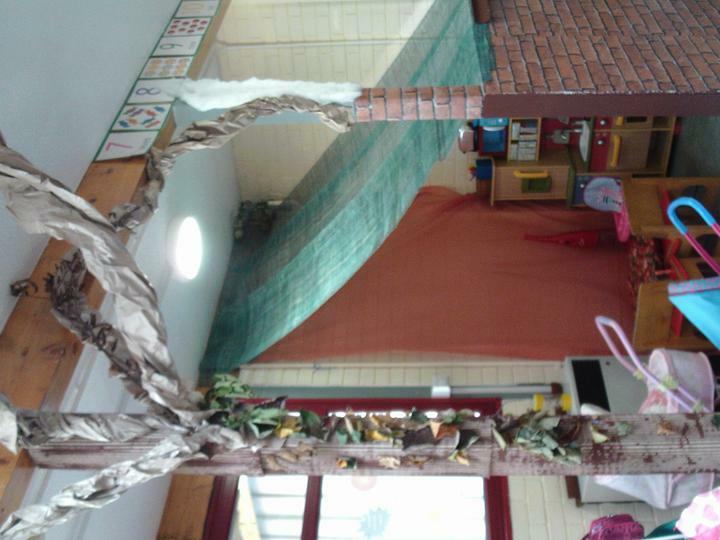 This week has been creative week and the children have all been very busy making things to decorate the classroom. 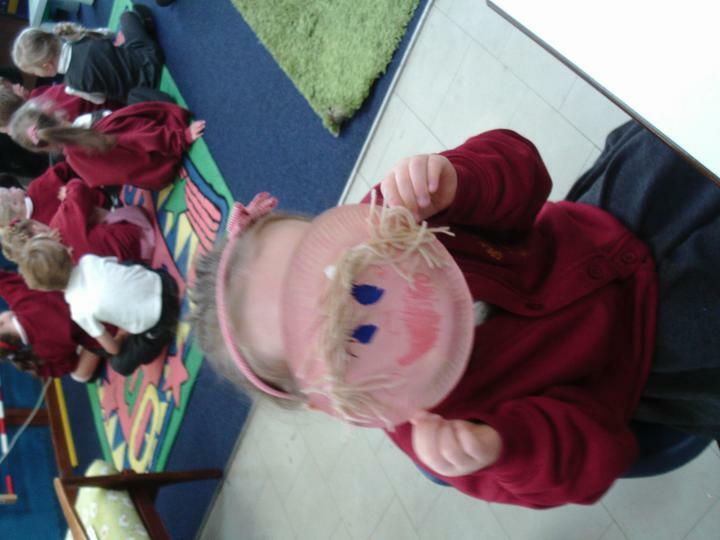 We are going to have a focus on nursery rhymes so we have created a humpty dumpty, a star, spiders and a sheep. Can you guess the rhymes they link to? We have also written some simple sentences about our summer alongside writing about our forest day on Tuesday. All in all a fantastic week back! We are very much looking forward to our new reception children joining us next week. This week we have been exploring partitioning numbers in to tens and units as well as practising counting in tens. In literacy we have been practising our SPAG (spelling, punctuation and grammar) skills as well as spelling tricky words. In science we have been learning all about the diets of different animals and deciding if they are carnivores, herbivores or omnivores! We have also started to make a secret surprise for mothers day...shhhh! We have really finished this half term in style down in Mars! 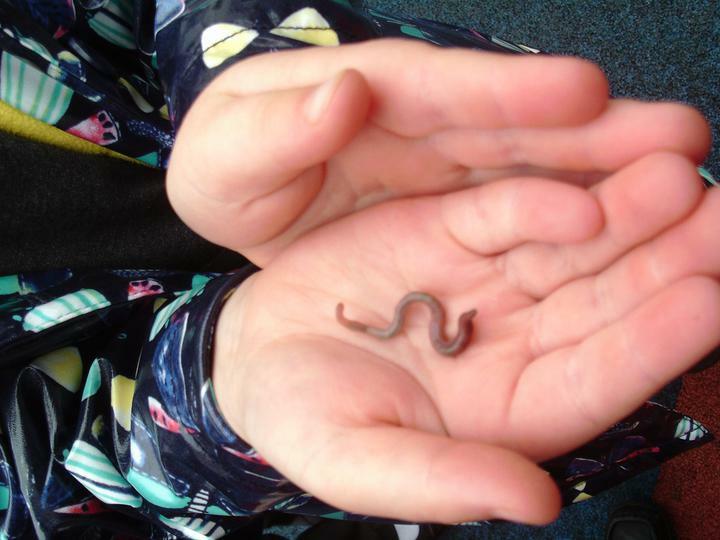 The children have had a fantastic week filled with lots of exciting things, and, of course, learning!! To kick start the week we celebrated Chinese New Year. The children made little dragons, Chinese lanterns, explored noodles and even made up their own dragon dance! We also made some yummy pancakes with Saturn class, Mars had the very important job of chopping all the fruit ready to top our delicious pancakes. Linking with our topic we have been practising our weaving skills this week. We learnt about how we can make lots of different things through weaving such as baskets and even chairs! Year 1 made their very own placemat by weaving paper and reception have been weaving fabrics onto our fence to decorate it. Year 1 have really enjoyed our maths topic this week - division! We talked about how it is important that we know how to divide, especially if it means sharing sweets out equally! 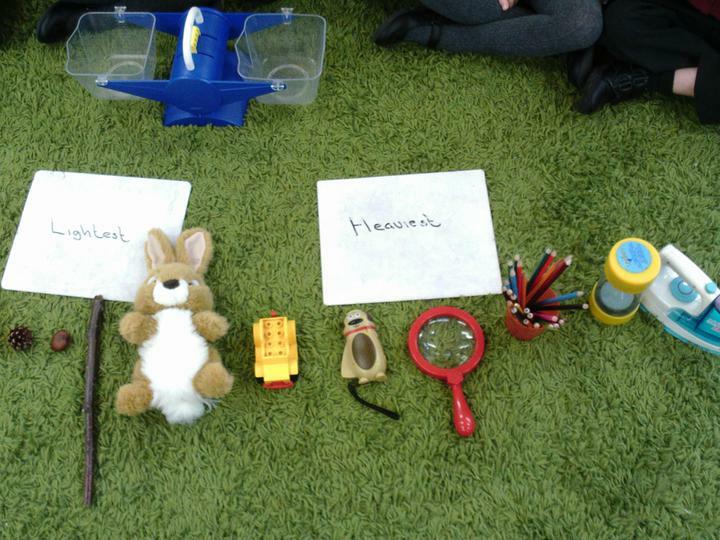 They even used our outdoor area by choosing different objects to help them solve different division problems. Today we took part in the whole school bird watch and then ended the day by making valentines cards and eating heart rice crispy cakes bought in by one of the children. Yum! The children (and adults!) all had a fantastic time at Grafham! Whilst learning new facts about our topic, The Great Fire of London, the children completed some amazing activities such as archery and map reading! What a whirlwind of a week we have had in Mars! The children have been very busy learning all about multiplication and how we can use both numicon and arrays to help us solve the problems. Even reception have joined in talking about 'lots of' different numbers. In literacy the year 1 children have been working on using feedback to help improve their work. We wrote a letter to the Queen and the next day the children used their feedback to improve and modify their letter, and then write it up neatly! 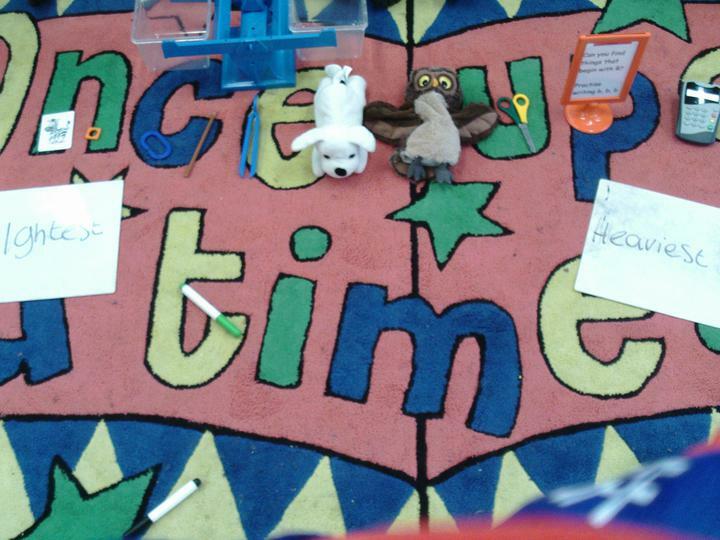 Reception been focusing on using different media to ‘mark make’ and practise writing their name. The biggest hit has been using the magic pen on the interactive whiteboard. In science we learnt all about our senses and how they help us to be safe in the world around us. We also discussed how some people don’t have all of their senses but use different things to help them stay safe and be independent. We even completed an experiment using our senses to look at, listen to, touch, smell and even taste popcorn! We have had a very busy week down in Mars! We have continued our work with money this week, particularly using number bonds to 10 to help us find change from 10p. 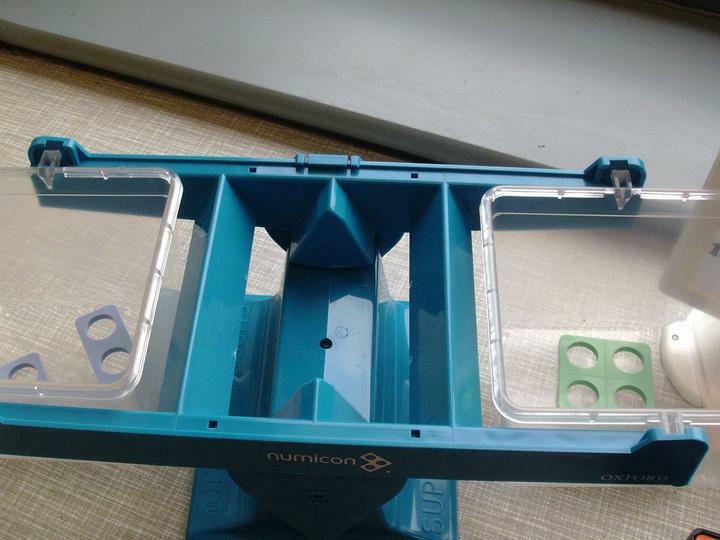 To help us with this we have been using numicon to practically help us find the difference. We are still using our book 'The Queens Knickers' in literacy and have been using adjectives to make our writing more interesting. We have also been working on checking our sentences to make sure they make sense. In science we have been looking at things that are the same and different between ourselves and animals. The children have all been working really hard in all areas of their learning this week, well done! Mars class have had a fantastic week! We have started using our book 'The Queens Knickers' (which the children have all found hilarious) in literacy and have been thinking about how we can describe what her knickers in the book look like. In maths we have been learning to recognise different coins and have started to add coins together to find different totals. We have been very lucky this half term to have a dance teacher in for one of our PE lessons. The children are all taking part and listening really carefully. This week we were also lucky enough to meet two real paramedics and look inside an ambulance. We talked about why they are important and all the different things you can find in an ambulance. The children even got to wear a special ambulance hat and stethoscope. 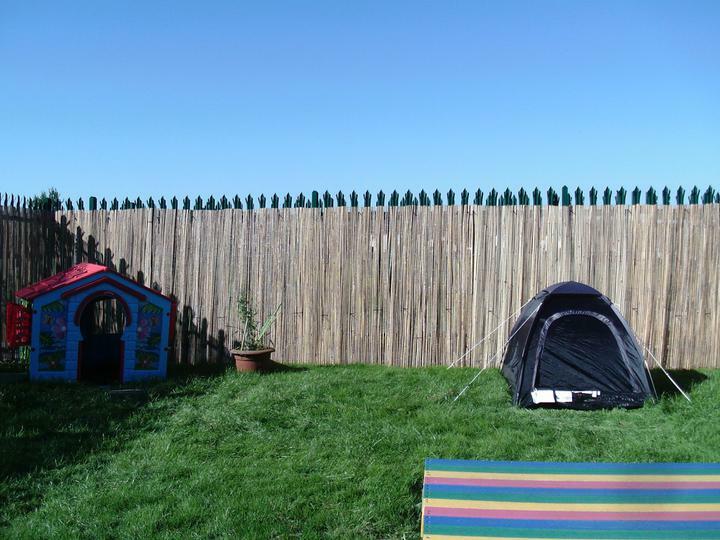 We have been working really hard to get our outside space looking nicer and more engaging for the children. 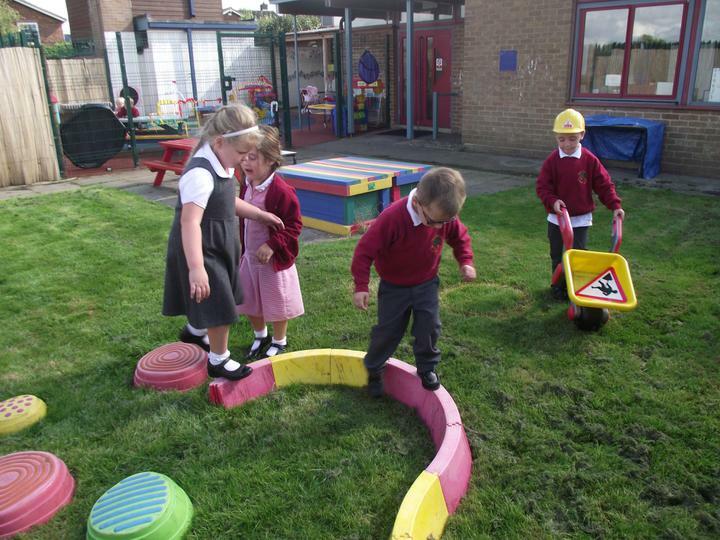 So far we have created a construction area, a small world area, a special Year 1 Zone and a mark making area for reception. It is a work in progress but we are very excited to see the change in our outdoor space, the children are certainly very excited about it! The children have all had a fantastic first week back and have been very excited learning about all our new topic 'The Great Fire of London'. They have learnt lots of new facts as well as a new song along with the actions! We had a fantastic final week down in Mars full of lots of fun activities! The children had a lovely day with our trust artist Jack Cornell, they created some beautiful galaxies in little petri dishes, alongside helping to make an amazing backdrop for our class display in the hall). As well as this we had a fabulous time watching the magician for reward day and we enjoyed all the party food we had bought in whilst listening to some very Christmassy music! We also had a very special visit from Santa on our last day. He bought us some wonderful new things for our classroom including a fire station and engine, some dressing up clothes, some building blocks and much more.